The following guilt-free finds were on Extra! Check 'em out, and sign up for Hungry Girl's FREE daily emails NOW! Brownies that are healthy? Yep! These AWESOME brownies have lots of vitamins, are fiber-packed, and are fudgy and delicious! 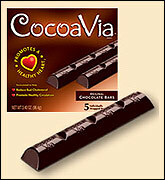 They're hard to find in stores but are available at vitalicious.com. YUM! This is our fave current potato chip swap! They come in 4 flavors (our fave is Au Gratin) and a serving is just 100 calories. Even if you "slip up" and eat the ENTIRE huuuge bag (which you shouldn't do), you'd only take in 400 calories and the same amount of fat you'd get in just one measly serving of regular potato chips. Hot dogs are scary. You never know what you're gonna get. Unless you BYOD (bring your own dogs). 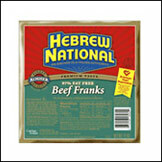 So show up at your tailgate parties with Hebrew National's 50-calorie, 1g of fat dogs and gobble 'em up! By the way, these yummy dogs are available at almost every supermarket. Dreyer's Slow Churned Light ice cream ROCKS! All of their flavors are great and taste EXACTLY like regular ice cream, but did you know they make seasonal flavors as well? Pumpkin, Egg Nog and Peppermint Stick are ust a few of our faves... Those are all limited editon flavors so stock up while you can! HG HEADS UP! Dreyer's and Edy's are the same -- only the name is different, depending on where you live! Now, thanks to our friends at Boca, you no longer have to run screaming from lasagna. Imagine eating a 10.5 oz. serving of cheese, sauce, noodles and "meat" (ok, soy that tastes like meat) all for 270 calories and 5 grams of fat (plus 5g of fiber). You can! Available where Boca products are sold. Sign up for your FREE daily emails so you never have to miss a guilt-free find again! Share this info with EVERYONE!